Pollak Vineyards is a small family-owned winery founded in 2003 by David and Margo Pollak. The original owner of Bouchaine Winery in Carneros, Pollak chose Virginia after trying a chardonnay by Jim Law at Linden Winery. Seeing the potential of Virginia for wine growing, they purchased a 98-acre farm along the Blue Ridge Mountains in the town of Crozet, located west of Charlottesville. A previous apple orchard and vegetable farm, they have thirty acres planted. The 2015 Viognier is the first viognier winemaker Beniot Pineau made at Pollak Vinyards, since joining in 2011. The viognier is cold soaked for 12-16 hours before fermenting in stainless steel. A small amount was fermented in barrel. Fifty percent of the grapes are fermented whole cluster. Fifty percent of the grapes get skin contact for eight hours. The wine is highly aromatic with a nose of tropical fruit, apricot and honeysuckle. It is bright, fresh and lively. On the palate, you can taste ripe stone fruit, such as apricot and peach. While some domestic viogniers can be flabby and flat, this one has a creamy mid-palate while delicate acidity dances around the front, back and sides of your mouth. If this is what viognier tastes like in Virginia, I understand why it was called the official state grape. The Pollak Vineyards 2015 Viognier, Monticello, Virginia wines retails for $26 and is the Please The Palate Pick of the Week. 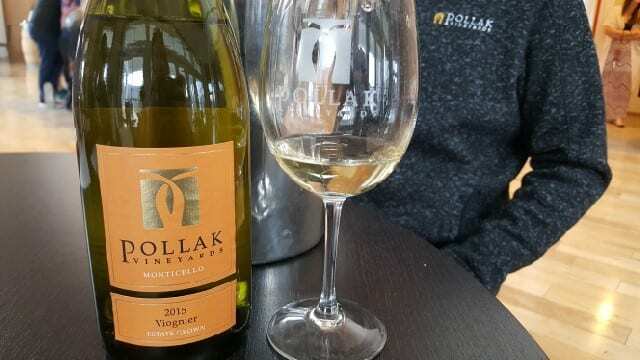 This entry was posted in Wine and tagged Blue Ridge Mountains, Charlottesville, David Pollak, Monticello, pick of the week, Pollak Vineyards, Pollak Vineyards 2015 Viognier, The Virginia Grape, viognier, Virginia, Virginia wine, Wine by Allison Levine.